In our day-to-day lives, we rely on vision more than any of the other four senses, so it only makes sense that human anatomy has adapted to include several features which keep our eyes safe: tear ducts, eyelids, and of course the orbital bone. The orbit (also known as the "eye socket") provides a rigid form of support and protection for some of the most sensitive parts of the eye including the central retinal artery, maeula, retina, choroid, and sclera. 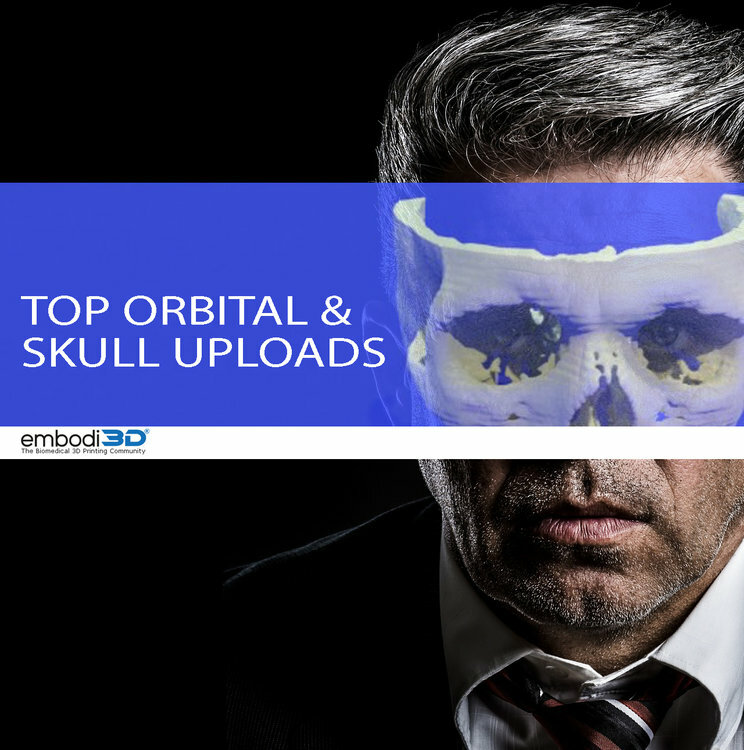 In recognition of this phenomenal feature of the human anatomy (and one of the most recognizable parts of the human skull), this week's embodi3D® Top Uploads articles, we are featuring several standout uploads — all of which can be used to create an orbital and skull 3D model. As detailed in the scholarly article "Clinical application of three-dimensional printing technology in craniofacial plastic surgery" 3D printing techniques are being used in craniofacial surgeries and especially in reconstruction procedures the require complex modeling. Using the latest 3D printing technology and the STL files converted using democratiz3D®, the contralateral orbit can serve as a point of reference for those in the medical field since the ipsilateral structures taken with a CT scan can be easily converted into an STL file and then fed to a 3D printer. These technologies improve patient consultations, increase the quality of diagnostic information while also helping to improve the planning stage of the surgical process. During surgery, a 3D-printed model of the orbital can be used to orient surgical staff and serve as a guide for surgical resectioning procedures. While these files are available for free on the website, you must register with embodi3D® before you can begin uploading and converting your own CT scans into STL files as well as downloading and 3D printing anatomical models from other users. Every day the collection of anatomical models grows on the embodi3D® website. This is but one of the many ways embodi3D® is seeking to revolutionize medical practices. The orbits are conical structures dividing the upper facial skeleton from the middle face and surround the organs of vision. Seven bones conjoin to form the orbital structure as we can see in the example below. This excellent 3D model of embodi3D® shows the superficial bony margin of the orbit, which is rectangular with rounded corners. The margin is discontinuous at the lacrimal fossa. The supraorbital notch (seen in the image below) is within the supraorbital rim and is closed to form the supraorbital foramen in 25% of individuals. The supratrochlear notch is medial to the supraorbital notch. Hisham published this excellent ct scan on embodi3D®. Direct fractures of the orbital floor can extend from fractures of the inferior orbital rim. Indications for repair of the orbital floor in these cases are the same as those for indirect (blowout) fractures. Indirect fractures of the orbital floor are not associated with fracture of the inferior orbital rim. CT scans with coronal or sagittal views and 3D models help guide treatment. They allow evaluation of fracture size and extraocular muscle relationships, providing information that can be used to help predict enophthalmos and muscle entrapment. Dropbear upload this excellent example of a right orbit fracture. The FD is a benign slowly progressive disorder of bone, where normal cancellous bone is replaced by fibrous tissue and immature woven bone. This entity constitutes about 2.5 % of all bone tumors. Choi, J. W., & Kim, N. (2015). Clinical application of three-dimensional printing technology in craniofacial plastic surgery. Archives of plastic surgery, 42(3), 267. Bibby, K., & McFadzean, R. (1994). Fibrous dysplasia of the orbit. British journal of ophthalmology, 78(4), 266-270.